Ever since I first saw Tyler Nordgren's awe-inspiring photographs of the Milky Way arching above the natural wonders of the national parks, I knew I wanted them on my wall. 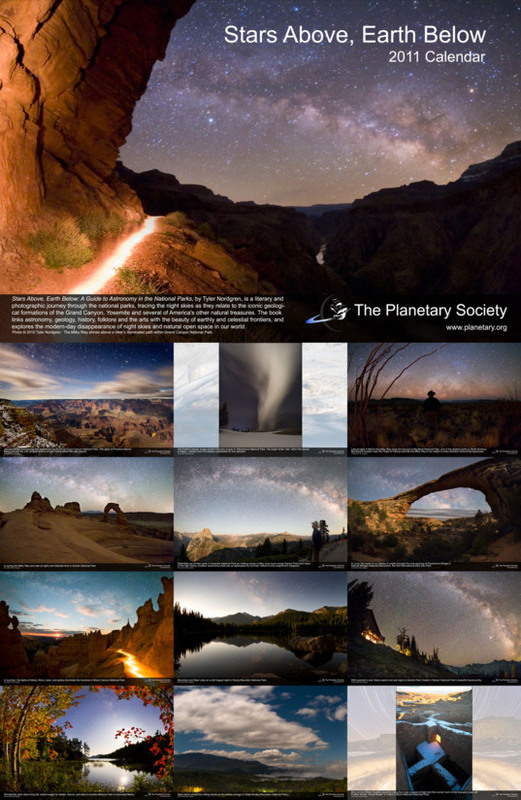 Well, now I can get them, and you can too, because Tyler has shared thirteen of his images with the Planetary Society for use in a 2011 wall calendar, which is now available on our store. I've made both small (8.5-by-11-inch, like A4) and large (11-by-17-inch, like A3) versions, but I think it's much better in the large format because of the wider aspect ratio, which works better for Tyler's amazing landscape photography. Thirteen images from Tyler Nordgren's book Stars Above, Earth Below: Astronomy in America's National Parks are available in a 2011 calendar from The Planetary Society store. Available in men's, women's, and kids' sizes in short and long sleeve styles from The Planetary Society Store. 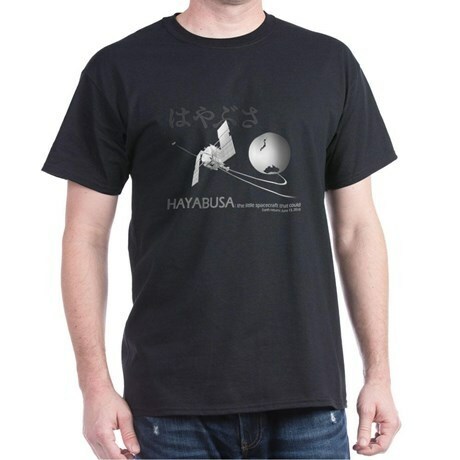 Celebrate the end of Hayabusa's dramatic seven-year journey to asteroid Itokawa and back to Earth with its sample. Japanese characters spell "Hayabusa." The small text reads "the little spacecraft that could" and lists the return date of June 13, 2010. Astronomer and artist Tyler Nordgren created a series of "U.N. Department of the Exterior Planetary Park" posters in the style of the iconic 1930s WPA posters for America's National Parks. 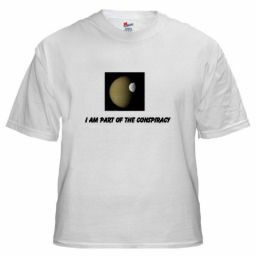 Buy these designs on apparel and posters at The Planetary Society's Cafepress Shop. And you can always just express your solidarity with the Society by getting "logo wear." There are a couple of posters available, and I want to create more; I'd welcome suggestions from readers for what you'd be interested in buying! In general, about $3-$6 of the purchase prices of any of the stuff from the Cafe Press store is a direct benefit to the Society. There are also other people who've stepped up to create cool stuff that benefits the Planetary Society. 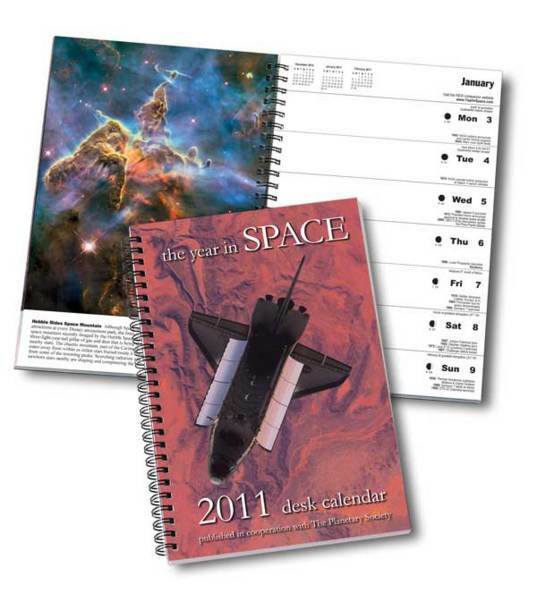 The annual Year in Space Calendar has just become available -- this is a wonderful desk calendar with a different pretty photo each week (and, this year, a special feature written by yours truly). There's Chop Shop's awesome T-shirt with 23 spacecraft, which I've proudly worn to every conference I've attended since I got it. Here I am wearing it at DPS. Here's another T-shirt that will only make sense to my readers, but it's good fun, and I thank Craig Clark very much for designing it and for setting up a Cafe Press store for it just so he can send all profits to the Planetary Society. I've got mine and will wear it with pride! 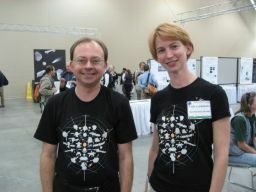 Let people know that you are involved in hiding the alien bases with this T-shirt, available from Cafe Press. Oops, I've said too much. Finally, if none of these items will do as a gift -- or if you don't think a $5 benefit to the Planetary Society is enough — then please consider giving the gift of membership in the Planetary Society!